Electric lawn mowers have a few benefits over gas models. For instance, they are more maneuverable and make less sound. However, gas lawn mowers are more powerful. Electric lawn mowers will do the job just fine if you have a small to medium sized garden, while petrol lawn mowers are more suited to larger gardens. With that being said, if an electric lawn mower seems like the right choice for you then look no further. In this list, we list the top 10 electric lawn mowers you can buy right now. This lawn mower by green works is a corded 20-inch electric lawn mower. It is a very popular lawn mower and for good reason too. Its 12 Amp Electric motor gives more than enough power to cut through tough grass, it is also height adjustable with 7 positions. You can cut your grass from 1.5 inches to 3.75 inches depending on your preference. The lawnmower weighs about 56lbs and can be folded for compact storage. Overall it is a great mower that is reasonably priced and highly recommended. This lawn mower by Sun Joe is another great electric lawn mower. Being an electric mower there is obviously very little maintenance – so no gas or oil tune-ups required. Other features include a detachable grass catcher so that you can easily dispose of grass trimmings and a 3 position customizable cutting height. Another good thing about this lawn mower is that is surprisingly durable, it will last you a long time as long as you treat it well. If you don’t mind spending some extra money on a quality lawn mower then this model may be the choice for you. As you can see it is more pricey than some of the others on this list. However, because of this, the lawn mower has some extra features, as you would expect. This electric lawn mower by green works is a cordless model so you won’t have to deal with any wires, it is also slightly more powerful than cheaper models and comes with a charger for the batteries. Overall another great mower that would work for mid-sized areas. This mower by black decker is the value for money side. It is height adjustable up to 6 settings, and it has a nice low profile design. One great feature about this lawn mower is that collects up to 25% more grass which means you will spend less time emptying it and more time mowing the lawn. Its a great small cheap alternative to gas-powered motors, and even though it is small, it still packs a fair amount of power. Instantly after using this electric lawn mower by EGO power, you can tell it is built really well. The machine really does look ‘premium’ and is engineered impressively. The materials used to build the lawn mower don’t look cheap yet it still manages to be fairly lightweight in design. Another positive about this electric lawn mower is the fact that is not too loud and it is easy to operate. The mower allows for 45 minutes cut time on a 30-minute charge. And when you’re done it folds up for compact storage. This mower by Earthwise deserves a spot on the list of Top 10 Electric lawn mowers for a few reasons. Firstly it offers good value for money. Secondly, it would especially suit you if you are after something lightweight. If you don’t want a large, hard to manage mower, and you only have a small yard, then this would be perfect for you. It is a very small piece of equipment however it simply gets the job done. Which is all you need in a lawnmower. This Sun Joe lawn mower is another mower that’s great on the portability side of things. The main benefit of this lawn mower is that it is cordless. So no need to worry about wires or extensions cords. It also has a powerful 12 amp motor and it cuts a 14-inch wide path. The cutting height can be adjusted within its 3 different options. It only weighs 29 lbs which means it will be easy to move around and carry if necessary. Also, the lawn mower is very easy to clean, a cleaning brush is also included. The only negative point about this mower is that the bag is really small. This is another great cordless lawn mower by Sun Joe. It allows for 6 level height adjustment which goes up from 1.18 inches to 3.15 inches in grass height. It is ideal for small to medium sized lawns. It is very easy to use, you can start it up at the click of a button. It has a powerful 600W brushless motor for increased battery efficiency and optimal motor performance. 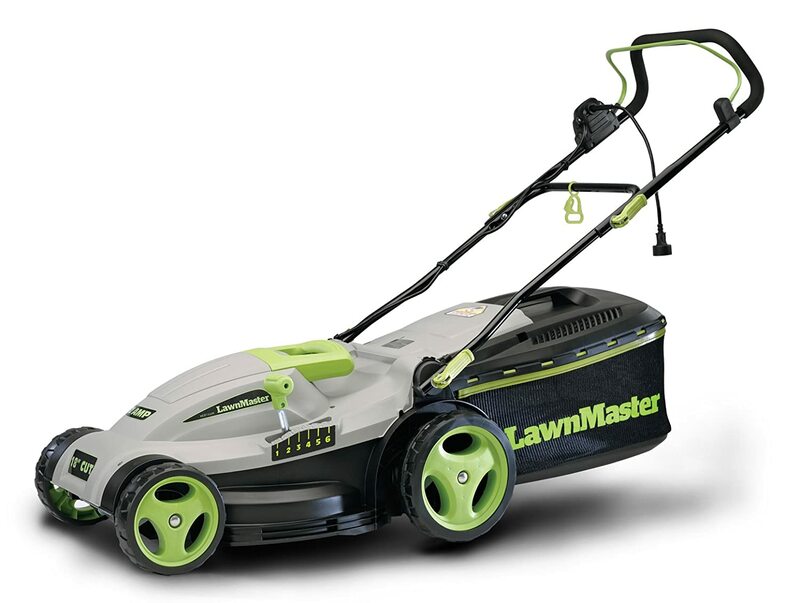 This lawn mower by LawnMaster offers good value for money. It is not the most powerful of lawn mowers, however, depending on your needs that shouldn’t be a problem. The 10 amp electric motor and the 16-inch wide deck will do just fine for smaller sized lawns. Overall it is easy to operate, well constructed cuts grass well and has no costly maintenance. The WORX electric lawn mower comes in an interesting yet cool looking design of orange and black. It has a caster wheel design which provides the lawn mover with extra maneuverability. You can turn it around without having to pick it up every time. On top of that, the handlebar can easily be collapsed with one touch, which allows you to store the lawn mower in a compact space. There are also 7 different height adjustments so you can find the one that’s right for you.